3. 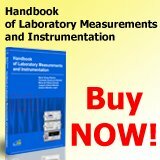 Sensors Web Portal's Media Planner 2013: How to Increase your Profit ? At Sensors Web Portal – the world’s source for sensors information, and International Frequency Sensor Association, we know that our media products, marketing services and tools will produce results and increase your profit. Why ? Over 12 years of online publishing leading business and electronic media on a global scale. We offer valuable online advertising programs. We pride ourselves that our readers are decision makers, buyers and customers. Our mailing list is continuously up-dated and added. 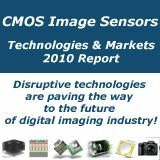 CMOS image sensor market is expected to grow at an 11 % CAGR in revenue in the 2012-2017 period, growing from $6.6B in 2012 to $11B in 2017. Many different applications are driving the integration of CMOS image sensors. If mobile handsets accounted for ~ 65 % of total shipments in 2011, many new applications are poised to drive the future growth of this industry. Three fast emerging applications of significant size should drive the growth of the market to an expected CAGR over 30 %: Tablets, Automotive, and Smart TV. More details are available in the report on each application. Click <here> for details and online order. Multiple technology changes are fueling booming market growth. 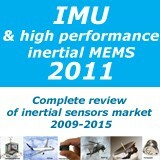 Inertial Measurements Units (IMUs) is a large industry traditionally dominated by defense and aerospace applications. 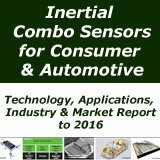 High-performance inertial sensors and systems is a dynamic market segment, as an ever-increasing number of platforms require stabilization, guidance or navigation functions. The 2011 market for high-performance gyroscopes was estimated at $1.29B, growing at a 4.3% annual rate, and is expected to reach $1.66B in 2017. This report describes in detail each application in terms of market size, competitive analysis, technical requirements, technology trends and business drivers. Click <here> for details and online order. 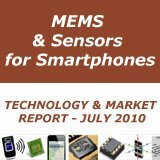 Fueled by consumer applications, MEMS market keeps growing and MEMS company acquisition values are climbing ! 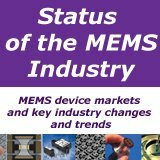 Based on 20 years’ experience in MEMS market analysis the 2012 edition of “Status of the MEMS Industry” (“MIS”), including MEMS device markets, key players strategies, key industry changes and MEMS financial analysis. It also includes major MEMS manufacturing evolutions as well as an update on the “emerging” MEMS device markets. Click <here> for details. 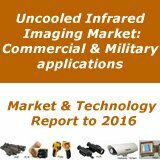 This report provides an overview of all the infrared technologies currently commercialized focused on uncooled Long Wave Infrared/thermal detection with microbolometers. Market forecasts till 2017 with in-depth analysis of commercial and military markets is provided, along with a description of the main active players and the lasts technological evolutions and future trends.Click <here> for details. 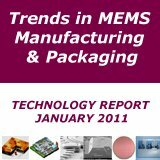 20 % annual growth to reach $5.4B in 2017.10 New MEMS Applications to be $ 100 M in 2017. The report highlights that novel MEMS opportunities need to be watched as they will fuel this market significantly. Click <here> for details.